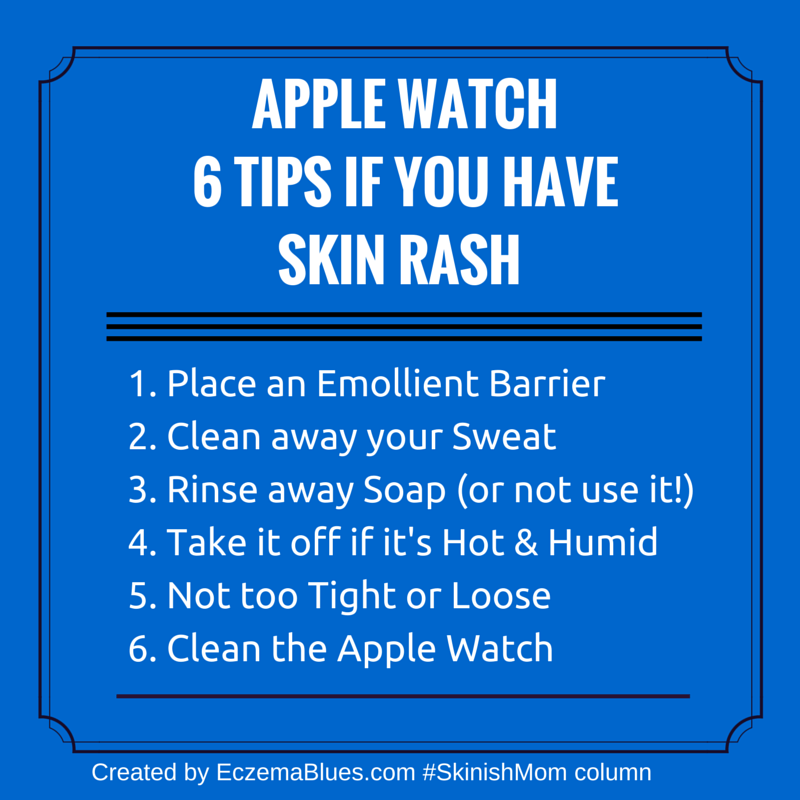 There were quite a few reports of users getting skin irritation from wearing Apple Watch and this got #SkinishMom into an investigative mode. It’s not news that items we wear can cause skin irritation, for instance, nickel in jewelry is a common irritant. It’s also not news that wrist bands can lead to skin irritation, for instance, there was a voluntary recall for Fitbit Force after news of rashes last year. As for Apple, there was also a reported instance of a child getting skin irritation after using iPad (due to nickel allergy). So what’s with these materials and their contact with our skin? Allergic contact dermatitis involves the immune system by which a hypersensitive reaction (rash) results from a previous contact with the allergen. Of the metal materials, nickel is one of the most common cited that cause this rash. In 2013, when UK issued new coins containing higher level of nickel, it was reported to pose an allergy risk. Apple Watch, the space gray Apple Watch Sport, the stainless steel portions of some Apple Watch bands, and the magnets in the watch and bands contain some nickel. However, they all fall below the strict nickel restrictions set by European REACH regulation. REACH stands for Registration, Evaluation, Authorisation and Restriction of Chemicals. It is a regulation of the EU, which is known for setting strict standards on safety. EU had restricted the amount of nickel in jewelry and products that come into contact with skin in the ‘EU Nickel Directive’. If Nickel is so much trouble, why do jewelry and wristband manufacturers continue to use it? It is usually selected for its corrosion resistance, toughness, strength at high and low temperatures, magnetic and electronic properties that are superior to other metals. The Apple Watch case, the Milanese Loop, the Modern Buckle, and the Leather Loop contain trace amounts of methacrylates from adhesives. Methacrylates are found in many consumer products that come in contact with the skin, such as adhesive bandages. Some people may be sensitive to them, or may develop sensitivities over time. Apple Watch and its bands are designed so that parts containing methacrylates are not in direct contact with your skin. The salts from sweat can crystalize and act as an irritant to the skin. If you can see that your baby’s sweat has dried and has a salty residue, then I would recommend rinsing it off with plain water (no soap) to prevent it from becoming an irritant. If the sweat is not crystalized, I wouldn’t worry about it much. Those familiar with eczema skincare know that soap is not recommended as it is drying (alkaline) and often irritate sensitive skin. In fact, soap is seldom patch tested as it is almost a certainty that leaving it on your skin for 2 days (norm period for patch test) will result in a rash. 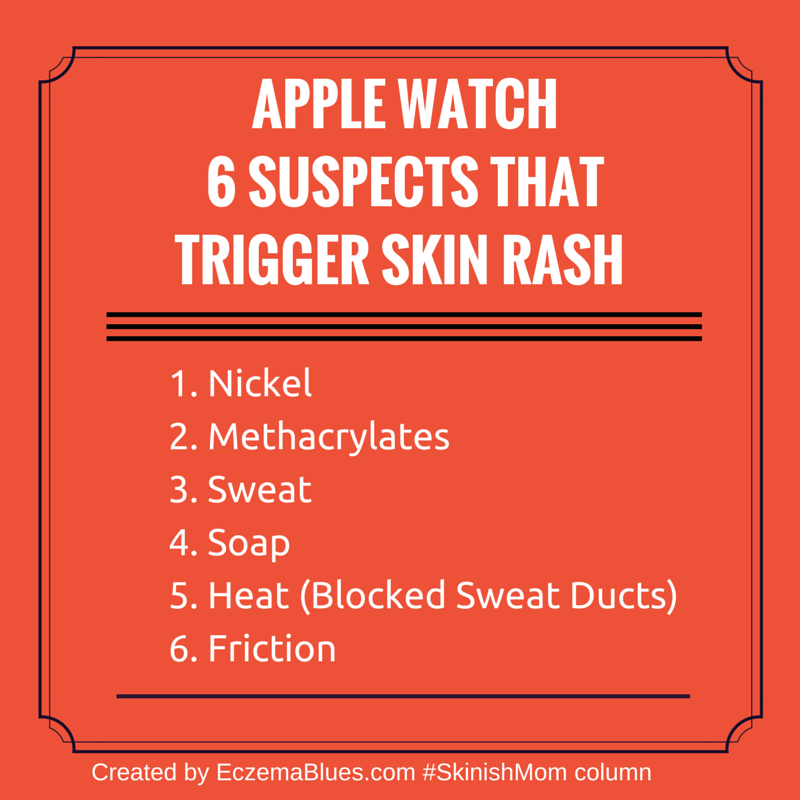 If your Apple Watch happens to trap the soap and you’re wearing it without removing, the soap may be the culprit behind the rash. If it’s hot and humid weather and your Apple Watch is constantly in contact with your skin, it may result in blocked sweat ducts. Similar to a common baby rash Miliaria (as babies have immature sweat ducts, thus more prone to blockage), your blocked sweat ducts can trigger skin rash. Constant friction causes chafing that can be painful. Moreover, exposed skin is more vulnerable to irritants. The sweat residue increases the friction. Wet (sweaty) skin makes the chafing worse. So What to Do if You Really WANT AN APPLE WATCH? If you have bought the Apple Watch > No reaction – Good for you! Place a barrier between your skin and the wristband – you can put a layer of emollient over but be sure that your skin is clean. Slapping moisturizer on top of sweat and irritant may worsen the rash. Of course, use a moisturizer that will not irritate your skin in the first place (ingredients to avoid). Clean your sweat off and put on the watch only when your skin is clean and dry. Make sure to wash soap off or use a gentle non-soap cleanser if you have sensitive skin. Not wearing it too tight or too loose – Apple had provided guidelines on this; both too tight and too loose can cause skin rash, think of a waist band that’s too tight or a watch that’s too loose and created friction. Keep the Apple Watch clean – it somewhat defeat the purpose of cleaning your own skin and then putting on something that has a host of sweat residue and debris for hours a day. Apple also has guidelines on cleaning their watch. I’m actually glad that I didn’t go out to get an Apple Watch (it’s not available in Singapore anyway!) because I always get skin rash with watches (leather or metal) and a gym mate told me you can’t play all your iTunes songs on the Apple Watch and can’t blue tooth the songs from the watch to the earphone (gasp! That’s the main reason why I want an Apple Watch). Do share your experience in the comments! Thanks for this. It has only cropped up a little, but I did notice it the other day after washing dishes without gloves on. I have sensitive skin anyway. But I think for me the issue is soap/warm weather. Anyway, daily application of the emollient barrier before showering helps (Aveeno Eczema lotion), as does washing the watch every morning before putting it on. But I sort of have to watch out for this kind of thing, anyway. Interestingly tho, it is in the vicinity of the magnet that I’m noticing the issue. One clarification tho — you absolutely CAN play all your iTunes songs via the Apple Watch and you CAN play whatever songs you want to load directly on it to a bluetooth earphone / ear buds (I use the Jaybird Bluebuds X). Its a great device. Hope you enjoy! Thanks Nicholas! I haven’t got an Apple Watch (just checked the Apple Store in Singapore and realized it’s on sale – previously the launch here was delayed due to the name ‘Apple Watch’ registered by another co) but good to know that I can bluetooth the songs over.. o.w. it’s kinda defeat the purpose of using it for fitness! Hope you don’t get the rashes too often, take care!